Karina's Kreations: Blooming with Kindness Stair Step Card! Blooming with Kindness Stair Step Card! I have a stair step card to share with you today. I used the Blooming with Kindness stamp set #128183. 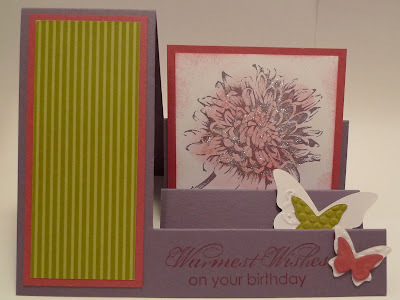 My card stock colors are Perfect Plum, Rose Red, Old Olive & Whisper White. I sponged the center of the flower with a sponge dauber and Rose Red ink. I added some Dazzling Diamonds Glitter with a 2-Way Glue Pen.